Skippy Fishback was born on a boat. You see, his parents were marine biologists; hence, they spent most of their time sailing the ocean looking for new species of sea life, returning to land only once a year for the annual marine biology conference. Anyway, Skippy was born with soft red hair and bright eyes as blue as the sea. Unfortunately, Skippy’s parents only had their son for a couple of months, because one day they put his high chair a little too close to the edge of the boat and little Skippy jumped out! He landed in the water with a splash and a giggle. His father dove in to save him, while his mother screamed in panic as she watched from the boat, but it was too late. Skippy was such a natural in the water that by the time his father touched the surface, Skippy was over half a mile away doing the backstroke. There was no way his father could catch up. Skippy’s mother was distraught – so was Skippy’s father, for that matter – but Skippy himself had never been happier. Like I said, he was a natural swimmer. Maybe it was because his parents were marine biologists. In any case, Skippy wasn’t the least bit scared and he loved spending his whole day swimming. By the time he was three years old, he was without a doubt the fastest creature in the water, and he had learned to hold his breath for up to 16 hours at a time. That meant he could explore underwater almost as long as he liked, and that is, in fact, how he met Sally the Sea Turtle. He was admiring the coral and sea shells at the bottom of the ocean when he came across a family of sea turtles. At the first sight of the human, even such a small one as Skippy, all of the sea turtles retreated into their shells – all except for Sally, for Sally was an extremely curious sea turtle. Skippy was bewildered. “You mean you can take it off?” he asked. And before Skippy could say a word, Sally slipped out of her emerald-green shell and slid it over Skippy’s head. 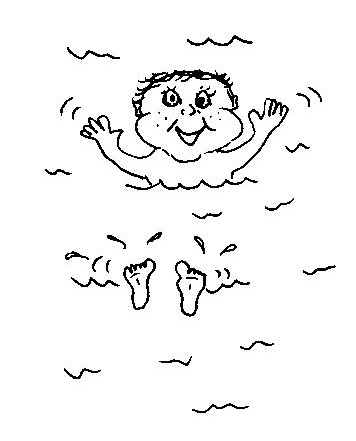 “Ah, I’m free!” Sally sang gleefully as she swam around as naked as a lizard. Skippy didn’t understand why Sally hated her shell so much. He thought it was simply marvelous. If he got tired, he could pull in his head and all his limbs and take a nap without worrying about predators. “I wish I had a shell!” Skippy exclaimed. “I’ll try my best,” Skippy promised. “Good luck, Skippy. I hope I see you again soon,” said Sally as she swam away smiling, happy to be rid of her burden. Skippy loved his new shell. It was great protection, and beautiful as well. It was only a little heavy, and Skippy could still swim faster than anything else in the ocean even with the shell. 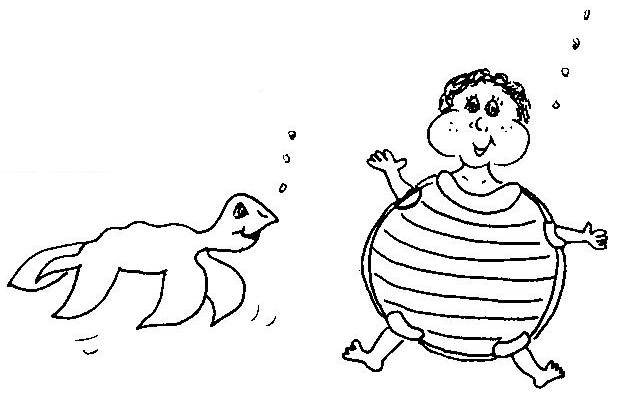 One day, while floating in his shell on the water’s surface, Skippy saw a big, silvery fish pop out of the water, soar gracefully through the air, and then, bounce! The fish bounced up and down on top of the water several times before disappearing again beneath the surface. Skippy was captivated, and he waited with anticipation for the odd fish to reappear. Go to the Chapter 1 worksheet.